First I need to say something: in recent weeks, when talking about working out, I’ve had more than a few people say to me, “Oh I lift weights! But I mean, I’m not one of those crazy bros with the tubs of protein.” I’ve heard this exact phrasing in completely independent conversations several times. 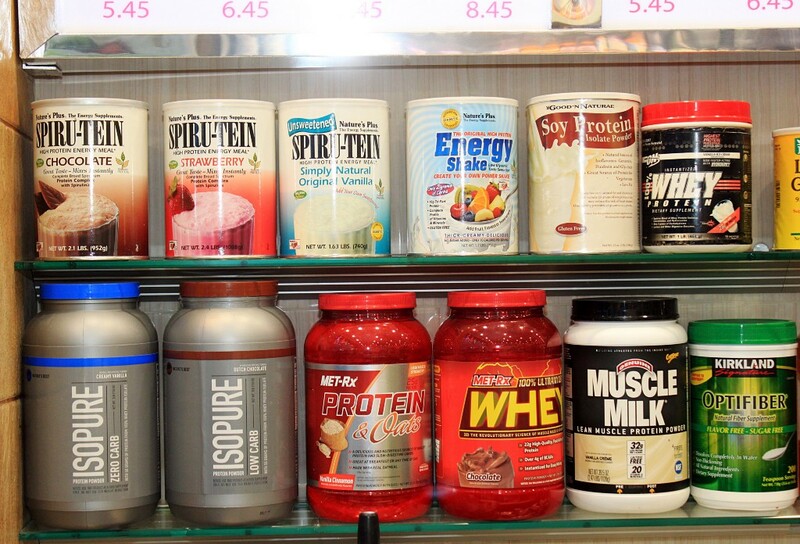 What is everyone’s problem with protein powder? It’s great if you are trying to build even a little muscle with strength training; protein powder is not steroids. This column has many goals, and now one of them is to destigmatize protein powder, a cheap, easy-to-store, and relatively tasty way to make muscles. If you’ve ever grabbed a Muscle Milk or a Naked protein smoothie from the bodega and been like, “mm lunch,” we are not so different, you and I. You don’t have to drink four protein shakes a day just because you have a tub of whey at home. Owning a tub of whey is not shameful; on the contrary, owning a bunch of tubs of whey is a correct and good move, as I will now explain. I have three tubs of protein in rotation at any given time, just for variety: one to put in my overnight oats, the best breakfast of all; one fruity one to mix with juice; and one to mix with milk. Most flavored protein is artificially sweetened, which, if I find anything unpalatable, it’s that. You ~can~ mix protein with just water, but I haven’t yet found a protein that I’d voluntarily drink like this. Optimum Gold Standard and Isopure Zero Carb (in the fruit flavors like apple melon or mango peach) are about as good as it gets, in my opinion (not #spon, this is just what I keep coming back to). Part of the problem is most powders are optimized to be low-carb and pretty low-fat, and those are two things that will make them taste bad. Protein powder is still subject to the laws of the universe. Another protein I used to use, Syntha-6, tastes very milkshake-like, but it was slightly lower protein and had more carbs and fat per scoop than others, so it was nice if I wanted to make a meal out of it and make a real smoothie, but sort of too caloric to just be a post-workout shake a lot of the time. I guess the lesson here is, if you find a protein powder with more calories and fats and carbs, it’s probably going to taste better than the highly-macro-optimized ones. If you’re in for making a full-on smoothie, you’ve already sort of hit on one key of making protein taste a bit better with your banana element, which is added sugar. You can add a little honey, fruit, chocolate sauce, agave syrup, or whatever, to round out the sweetness profile a bit. You might also be surprised what a pinch of salt will do for a protein smoothie; that’s what the peanut butter is doing in your current recipe. Another option is adding a tart element like more fruits or yogurt, or something fatty, like avocado. Just avocado and vanilla powder are pretty good! I’ve been lifting for over 7 years, so not a newbie. When I started, not many women were into powerlifting, and social media was not as big as it is now, so I didn’t talk much about my lifting. But over the last few years obviously loads of women have got into lifting and social media is full of women lifting (which is great). Despite lifting for a long time I don’t look remotely swole or even lightly muscled. I’m big and soft and chubby. Recently I’ve started posting lifting pics on Instagram, and I feel embarrassed because people basically assume I’m at the beginning of my “fitness journey” and need encouragement. I get lots of “Good for you!” type comments from people who have been lifting for like 6 months. I don’t know how to respond in a way that’s not rude and correcting them? I feel a good approach is to say to them, in your most dangerous voice, “Are you calling me a liar?” And then you pick them up, throw them across your shoulders, and squat them. This has always worked for me. Most people don’t even have context for what “strong” or “experienced” is when it comes to lifting. You could tell them you can deadlift 300 pounds, and it may sound like a lot, or it may not, if they don’t even know what deadlifting is. This might be an unsatisfying answer, but I think you might have to start by forgiving these people their ignorance. Embrace it as a time to “actually” them, if you want — actually, it’s difficult for women to build very visible muscles! Actually, strong people don’t look any particular way! They are being a little bit rude, if unwittingly; you’re not out of line to gently own them. As for the Instagram commenters, it doesn’t feel impossible to me that some of them are just excited for you that you’re proud enough of your personal accomplishments to share them. “Good for you!” is a nice thing to say sincerely to anyone at any time, like, just being alive is hard enough. I’m commenting on someone’s selfie tonight to tell them I’m proud of them. But I know what you mean; again, these comments sound like they’re built upon unfair assumptions. The nice thing about Instagram is you don’t have to respond to anyone; depending on the person, you might even be able to delete the comments, if they bother you. But you could also head some of it off at the pass with a very deliberate photo caption, if you are in this to share things about yourself. You could say something to the effect of “When I started lifting seven years ago, I couldn’t budge a 15lb dumbbell for a single rep. Today, I deadlifted 300 pounds! That’s two people! I’m so proud of my body and what it can do! Fear me!” And then really just ignore everyone else who keeps trying to patronize you; you are not under obligation to explain how swoleness works to everyone. But I am, so feel free to send them a link.